i don’t know about you, but i love this time of year with the slight change of season. it’s getting warmer. we’re changing our fashion. and we’re changing the things we do with our hair. here are few things about trends that we need to remember. it’s really important to take the leap (if you’re so bold.) but you have got to be cautious about going wayyyy too far. here are a few examples of my favorite spring 2009 hair trends… and i’ve also got a couple examples of going a little too over the top. i have to tell you… i am obsessed with jennifer lopez’ new bangs- and hairstyle- and color- and fabulousness- and on-and on… i love it! here is an example of how sienna miller is wearing a really loose and youthful ‘half up- half down’ done beautifully. she looks very carefree and current. be careful not to over-coif, pin too tightly, and wear the ends too big. w.t.f.??? in this case… wear the forehead. these ladies look beautiful in their double headbands and the reason why this works for them is because they haven’t plastered their hair under the headbands. a little shape minus the major shellacking is what is need for this simple trend. 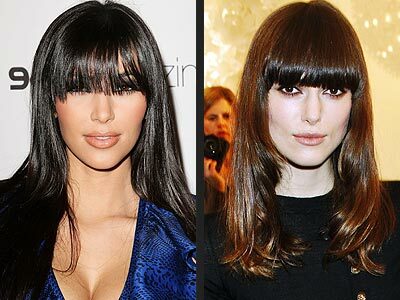 you know me… and you know i love me some bangs! so let’s see… what’s wrong with this hair? hmm…i see… you can’t see! i know this seems rather obvious, so why doesn’t she see this is so? if the eyes are the window to the soul, kim needs to open the curtains. keira can keep her curtains closed. nicely done. i love the way these ladies look in their sassy side knots. make sure to keep it level with your eyes and lower, and behind your ear. star wars is over and so is princess leia’s hair. i love the look of the single braid around a portion of the hairline, the milkmaid braid, and the twisted fringe. they look fantastic when done tastefully. make sure you stray from twisting the whole front hairline. stick with just one side or just the top. 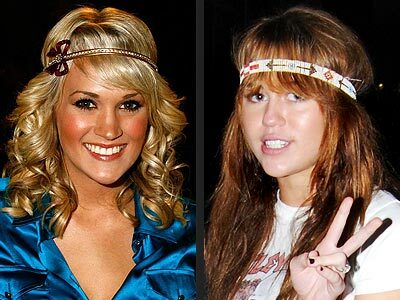 the headband over the bangs can be a rather tricky situation… i’m not a total fan of either of these first two looks, but believe it or not i totally love paris’! she looks so exotic next to her hilarious hot-mess gal pal, kathy! make sure when wearing this look that your hair is pushed slightly forward and certainly avoid looking like the top of your noggin will pop!